I just love, love, love Stephen Colbert. I think he’s simply brilliant! The character Colbert’s willful ignorance and gleeful silliness is just impossible to dislike. His third book and the sequel to I Am America (And So Can You!) was released this month and I couldn’t resist picking it up a couple of weeks ago. America Again: Re-becoming the Greatness We Never Weren’t is genius satire on highly important and current topics, just like it’s predecessor. Colbert tackles the American institutions of healthcare, jobs, food, justice, elections, and more, supplemented with colorful photos, diagrams, and silly footnotes. His wry commentaries on these facets of American life and politics are sharply pointed, with each chapter coming to an ironic and often ridiculous conclusion. Sometimes the humor is a little mean or vulgar, but more in a sarcastic way rather than offensive. As far as readability goes, America Again was easier and quicker for me to get through than his first book. 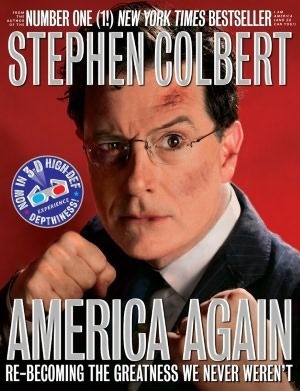 Since I don’t watch The Colbert Report regularly anymore (cancelled cable a few years ago), averaging my reading of America Again to a chapter a day was a perfect dose of Colbert for me. I think reading more than that in one sitting could result in the material becoming stale. But the Real Question is: are America’s best days behind us? Of course they are, and always have been. We have the greatest history in the history of History. But never forget, our best days are also ahead of us, and always will be. Because America also has the Greatest Future in the history of the Future. It’s our Present that’s the problem… and always is be. Read from October 8 to 17, 2012. This entry was posted in books and tagged economics, humor, politics, society by kristin @ my little heart melodies. Bookmark the permalink. I can’t wait to read this! I keep forgetting to request it from my library. Off to do that now!